Explanation: One of the largest coherent structures on the sky is known simply as Loop I and can best be seen in radio and X-ray maps. 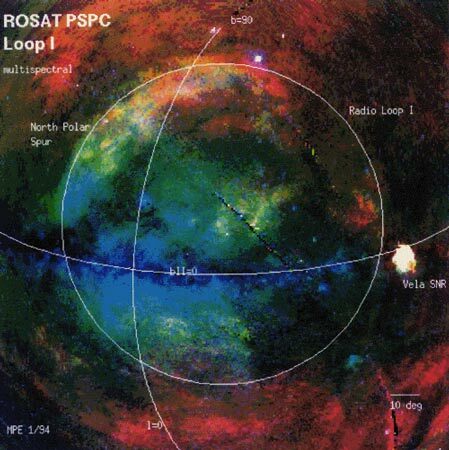 Spanning over 100 degrees, part of Loop I appears so prominent in northern sky maps that it is known as the North Polar Spur (NPS). Loop I, shown above in X-ray light, is a thin bubble of gas about 700 light-years across with a center located only about 400 light-years away. Surprisingly, the cause of this immense structure is still debated, but is possibly related to expanding gas from a million-year old supernova. Loop I gas is impacting the nearby Aquila Rift molecular cloud, and may create relatively dense fragments of the local interstellar medium. Were our Sun to pass through one of these fragments in the next few million years, it might affect Earth's climate.